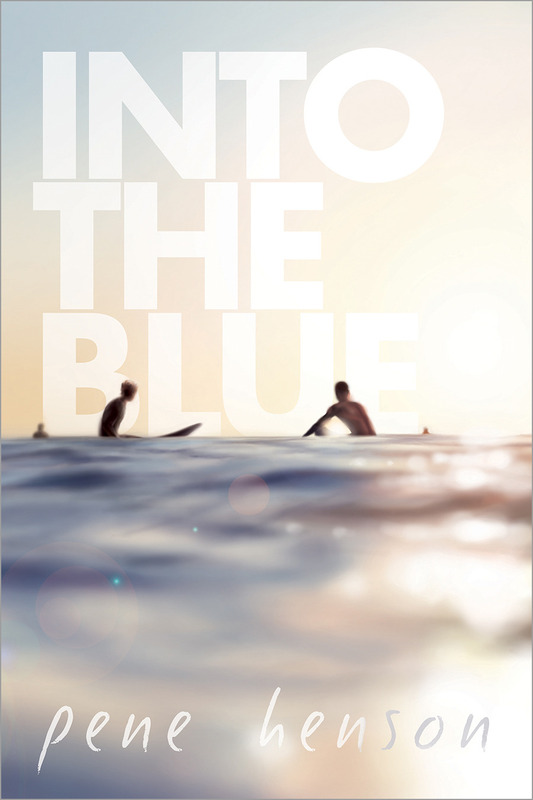 A while I promised a review of Pene Henson’s Into the Blue, which has received a starred review from Publisher’s Weekly as well as excellent reviews from Romantic Times and USA Today — so well deserved! 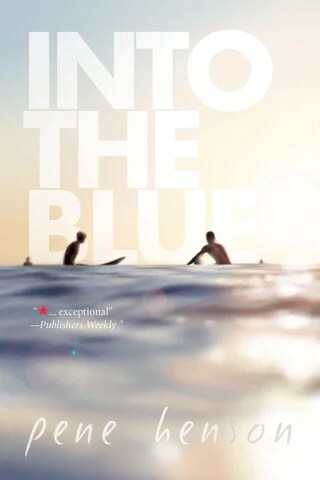 Into the Blue is the moving story of long time best friends Tai and Ollie, who grew up surfing the North Shore of Oahu together. This book is Henson’s debut novel; it’s beautifully written and aches with the complexities of the protagonists’ stories. Their history and friendship is handled with great skill. There is never a moment when the forward progress of the story is bogged down by exposition that fills us in on the past. Instead we are treated into an inside view of their found family (their roommates Hannah and Sunny, and Ollie’s little brother Jamie) through the story, within it. It is immediately clear that Ollie and Tai have a very special friendship. Our perception of how special becomes more clear as we get to know Ollie, who is by turns prickly and unsure, who has a hard time with other people but who is quietly magnetic and lovable, even when it’s hidden from everyone but those who know him best. He’s foiled beautifully against Tai, who is magnetic as well but also magnanimous and outgoing. Together they make sense; when their relationship takes a turn from friendship to lovers, there is something between them that intrinsically works, even when we can clearly see them testing and blundering through situations of their own making. I mentioned the beautiful writing; the landscape that Henson places her characters in is so vibrant. There’s such attention to detail. I felt transported – this book is a wonderful getaway. The sense of pause, that in between, that moment in their relationship where they can be something other than the friends they always have feels like a treasure and privilege to witness. While Tai was a joy to read, Ollie was, for me, a revelation. I love his complexity and reticence. I love how he’s portrayed, like the world doesn’t always fit him, or like he’s not sure how his edges fit into the world. This is the second book this year I’ve read with a demisexual character and Henson handles his truth and story very carefully and thoughtfully. She also handles Tai’s progression through their relationship deftly – we get a good sense of how Tai packed the potential for feelings away when he and Ollie were younger after Ollie’s mother passed away, how and why he chooses to go along with the change in their relationship, but also how his fear of falling for Ollie and harming their found family complicates everything once they are brought back to their regular lives. None of these are over explained or overwrought. Instead they feel natural, and like the mistakes young men make when they’re figuring out what they want in life and how to get it. Henson’s trust in the reader and in her characters makes falling in love with them as they fall for each other feel utterly natural and earned. Five stars—if I could, twenty stars – for this stunning debut. Five as well for the beautiful cover, which makes me want to run away to the nearest beach to re-read this book yet again. For a chance to win a 25$ gift card from Interlude Press, check this postthis post out on the author’s blog about her virtual book tour! So, if y’all follow me on twitter (@judesierra), you know that I have a long standing love affair with Avon Gale’s Scoring Chances series. I’ve read and re-read the first two books in the series (Breakaway and Save of the Game) at least five times — no exaggeration. This series follows hockey players (OMG HOCKEY ROMANCE, YAS) who play in the ECHL. I’ve been lucky enough to get an advance copy of her newest addition to the series, Power Play. I have so much love for this series, and this book was such a great addition. Gale has a gift with character voices: they are always clear and unique and each character is so well written. They’re flawed and funny and quirky and passionate and so deeply lovable. Power Play is the story of Max Ashford and Misha Samarin, who are paired to coach the worst team in the ECHL, the Spartanburg Spitfires. They’re hired by a smarmy GM who is more interested in getting his team attention through sensational media, and Max and Misha’s past offers ample fodder. Years ago, Misha accidentally caused a freak accident in a Stanley Cup playoff game that ended Max’s career. Determined not to let their past — or their GM — affect their desire to help their team, Max and Misha slowly navigate their relationship, from being coworkers to friends to lovers, over the course of the novel. Max is like sunshine in this book, and it doesn’t feel contrived. I love that he went through something heartbreaking but found a way to manage it, live his live, redirect with a positive attitude. I really loved that, because that’s a really realistic option for dealing with setbacks, but it can seem insurmountable. It’s not! Max makes that clear. Misha is complicated and deep; he has a painful backstory he doesn’t know how to handle, and lingering guilt over the accident that ended Max’s career. The way he comes to trust Max and forgive himself is handled beautifully, as is his commitment to protecting and caring for his players (AKA Isaac Drake, who will be featured in her upcoming novel). I have a weakness for hockey romance and this series hits every sweet spot. I cannot wait for book four, Empty Net, which will be available in the fall. I might cry in the interim months. I so highly recommend this series and this book!